I love Picross. 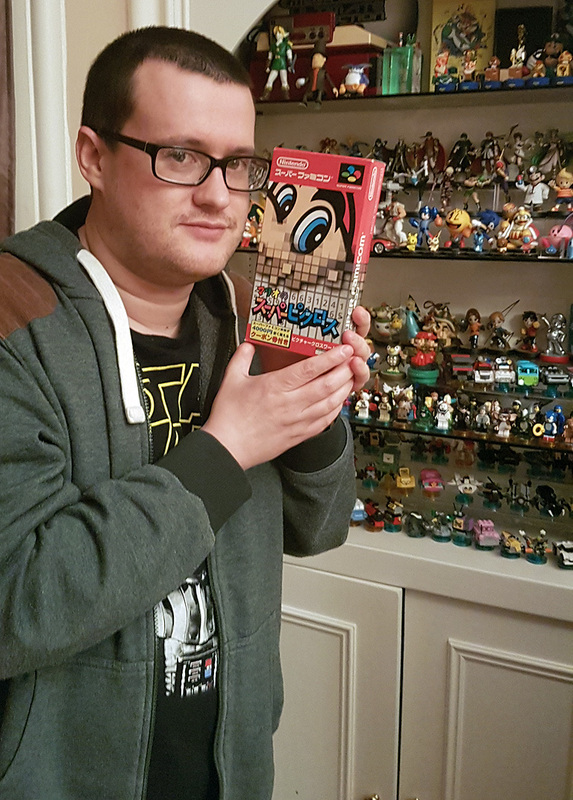 I’ve loved it ever since a 12-year-old me visited the Edinburgh branch of Toys R Us back in 1995 and discovered Mario’s Picross on the Game Boy. This relationship has survived 21 brain-teasing years. And, as in the best relationships, just as things look like they’re starting to go stale something manages to breathe new life into proceedings and remind me why I fell in love in the first place. My imported copy of Mario’s Super Picross, only ever released in Japan, is one of my prized possessions. Picross DS – arguably the best version to date – introduced themed puzzles, keeping things feeling fresh by adding new graphical styles and music throughout. Over the years I’ve also dabbled with variations on the theme. Pic Pic, a rare third-party DS game from Success, offers a few interesting spins on the ‘solve a puzzle to make a picture’ format, while Hudson Soft’s Illust Logic DS features more traditional Picross puzzles but adds colour to the mix. 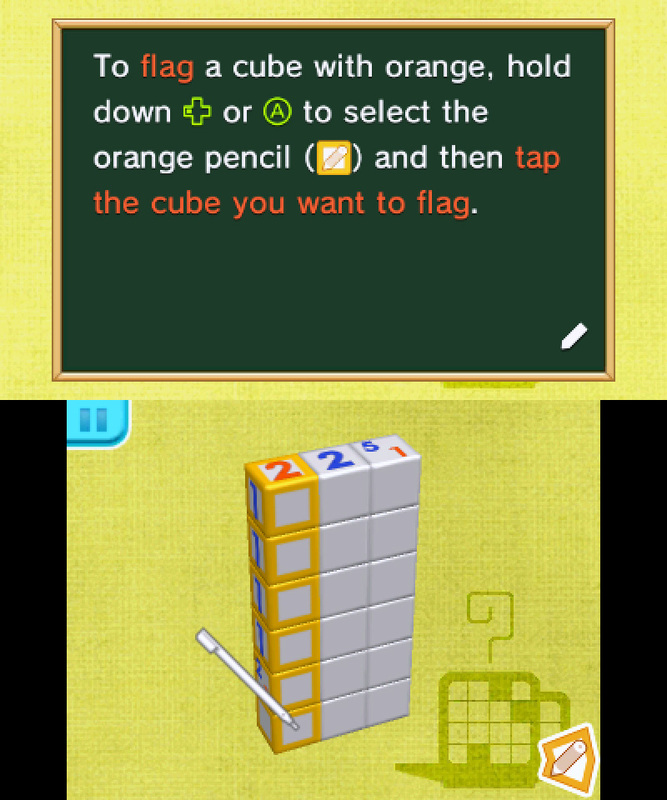 The best of these spin-offs, however, has been Picross 3D. Developed by Smash Bros studio HAL Laboratory, it added a third dimension to standard Picross puzzles and had you chipping away at a big block instead of a simple 2D grid. Why does this matter? Because that hot cousin is back in town again, and this time it’s offering a brand new mechanic. Which doesn’t really fit the ‘implied affair’ metaphor that well, but I’m going with it. 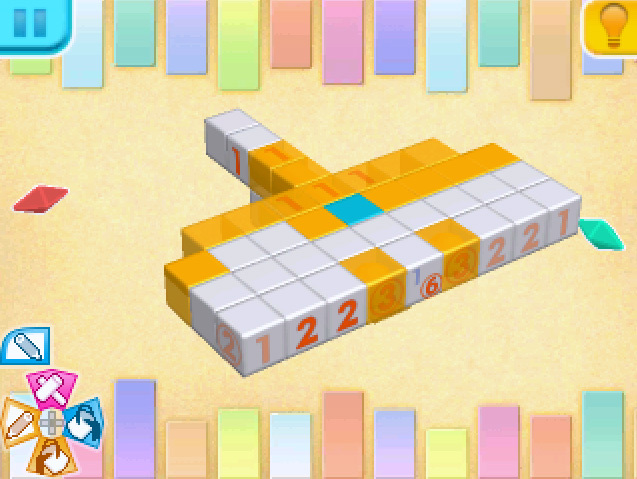 At first glance, Picross 3D: Round 2 looks similar to its predecessor. Once again you’re provided with a large rectangular prism made up of a number of smaller cubes, and it’s your job to make a 3D model out of it by chipping these cubes away. As before, some of these cubes have numbers on them: these are clues which tell you how many cubes a particular row should have remaining once everything’s been chipped off. By using these clues, you can logically figure out which cubes to chip away and which ones to mark as keepers, eventually using a process of elimination to remove all the unwanted cubes and make the model. This time, though, a new rule has been added which completely changes the way the game is played. Now you aren’t just chipping away the cubes you don’t need: the ones that remain have to be coloured either blue or orange, and you have to decide which. Messing around with a tried-and-tested formula is a dangerous game. The original Picross 3D already did this pretty drastically and by tweaking it even further there’s a good chance HAL Laboratory could have jumped the adorably blocky shark and ruined Picross. This hasn’t happened. It’s still incredible. There’s a difference between blue and orange blocks. 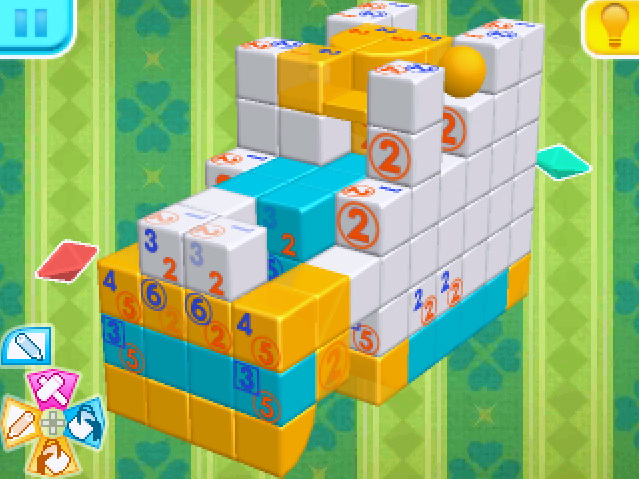 Blue ones remain as cubes, but orange ones are sculpted into different shapes once a full row’s cleared. 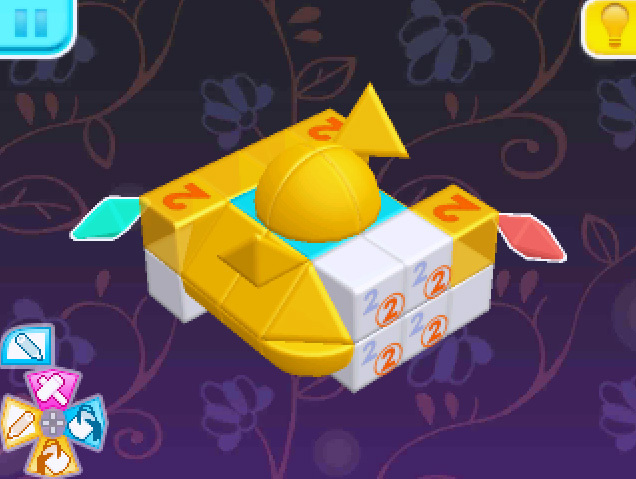 Using this knowledge, if you get good enough at the game you can even start to make educated guesses, adding a new element of depth to the gameplay: do you continue to treat it as a puzzle game and use logic, or do you let the image-building side of you take over and try to risk guessing how it’s going to look? The new mechanics mean new strategies are needed, and the game does a decent job of introducing these strategies to you. They may take a little longer than some would like and spell things out in extreme detail, but once they’re done you’re at least confident you’re armed with everything you need to know to take on the 350+ puzzles on offer here. The new colour system also means you’ll have to once again go through the Picross mastery routine that all Picross players experience when they first try the game out. At first you’ll play some early puzzles, think “this is a piece of piss” and worry it’s too easy. Then, suddenly, the puzzles will get larger and you’ll find yourself with countless mental blocks (ahem) as you struggle to figure out what you should be doing next. And then, eventually, it all clicks and the game becomes an entirely different beast: both relaxing and challenging at the same time, you can be stumped one minute and feel like the Picross equivalent of Neo from The Matrix the next as you notice regular patterns of numbers and colours and learn from muscle memory how to deal with them. There is no puzzle game in the world as satisfying as Picross, and Picross 3D: Round 2 is an immaculate example of this. It’s got more character than previous games in the series, too. Every puzzle comes with a little description that teaches you more about it once it’s solved, which is a nice touch. Even lovelier are the cheery messages that appear as you’re playing. Successfully mark half the blocks in a larger puzzle and you’ll get a little “halfway there!” message, urging you to keep going. Approach the end and a teensy “nearly there!” briefly pops up, like a friendly police officer giving you encouragement over a headset to try to keep you relaxed while you methodically defuse a bomb. For the first time in the series, you can also select a difficulty level for each puzzle. Choosing Easy, Normal or Hard will affect how many clues you get and how obvious they are. Playing in Hard isn’t just adding a challenge for the sake of it, mind: there’s an incentive to do so. A new scoring system gives you points depending on how many mistakes you make and how quickly you took to clear the puzzle, but crucially your score is then multiplied depending on which difficulty you chose. You’re then awarded one of four jewels depending on your score: naturally, getting the best jewel (the equivalent of an ‘A’ rank) more or less means beating the puzzle quickly on Hard with very few (if any) mistakes. These jewels are then used to unlock new puzzles in the game, though there are other ways to do so too. It’s a nice way of encouraging players to up the stakes a little, without entirely hindering their progress if they aren’t ready to raise the difficulty yet. I bought Pokemon Sun last week and was enjoying it thoroughly until my Picross 3D: Round 2 review code turned up. I haven’t touched Pokemon once since then. I’ve been playing Picross in bed. I’ve been playing Picross on the loo. Whereas I’d usually watch a film in the evenings, I’ve been watching stand-up comedy shows on Netflix instead so I can play Picross at the same time. To clarify: this is a game that has stopped me watching B-movies. Anyone who knows me knows how big a deal this is. I can only think of one flaw, and it’s relatively minor: it would be nice to see what the conditions were to earn each type of jewel for each puzzle. Sometimes when I’m playing on Hard, messing up once is still enough to get a ‘Great!’ rating in the Strikes category (needed for the best jewel), but sometimes when I make one mistake I only get a ‘Fine!’. Clearly this rating is dependant on the complexity of the puzzle, but they’re arranged by topic, not difficulty, so one minute you’re playing a hard one and the next it’s an easy one so it’s never always clear how many errors you can get away with before having to restart to get the best jewel. This is literally the only issue I have, though. I’d love some DLC too, in fact, but that’s an argument for another day. I’ve got enough to keep me going here for tens, maybe hundreds of hours. Whether you’ve enjoyed a Picross game in the past or you’re new to the series and are curious, you have to buy this. It’s just challenging enough to keep you thinking without ever frustrating you, and it’s so bloody charming it might as well come with a set of rubber lips that kisses your hand like a Victorian gentleman every time you complete a puzzle. I hate hyperbole and I don’t use it often. But I am not exaggerating in the slightest when I say that Picross 3D: Round 2 is one of the finest puzzle games ever made. Picross 3D: Round 2 comes out on Friday. If this review’s convinced you to buy it and you plan on buying the physical copy from Amazon UK, please do it using this link. It won’t cost you any extra and Amazon will chuck me a few pence to go towards maintaining the site. Disclaimer: This review was made possible ahead of the game’s launch thanks to a review copy provided by Nintendo. Although the gushing contained in the review might suggest otherwise, receiving this code in no way affected my ability to give a fair and honest review. For example, I thought Mario Tennis: Ultra Smash was utter shite.